This painting is a preparatory study in grisaille (monochrome painting) for the high altarpiece of the church of the Récollets, in the city of Antwerp where the artist lived and worked for most of his life. It depicts a scene from the New Testament in which a Roman soldier pierces Christ’s side with a spear to ensure he is dead. 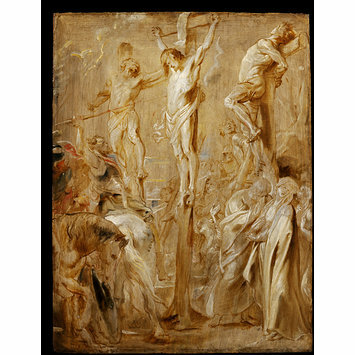 The present sketch is fine example of Rubens’ art which imported the monumental Baroque style from Italy in Flanders and deeply influenced the development of 17th-century Flemish painting. This painting is a ‘modello’, i.e. a preparatory study for a painting. 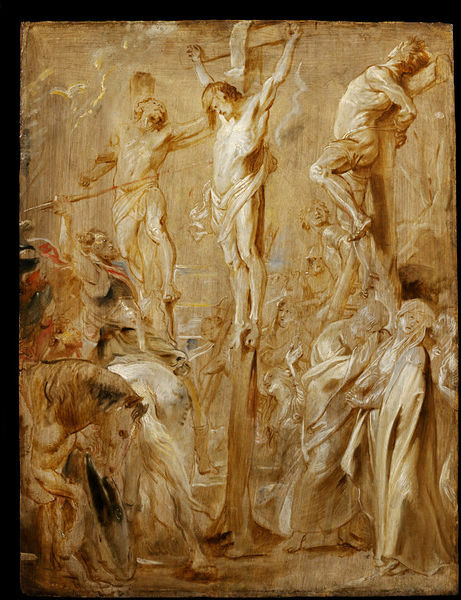 More specifically it is an oil sketch in grisaille (monochrome painting), a technique often favoured by Rubens. 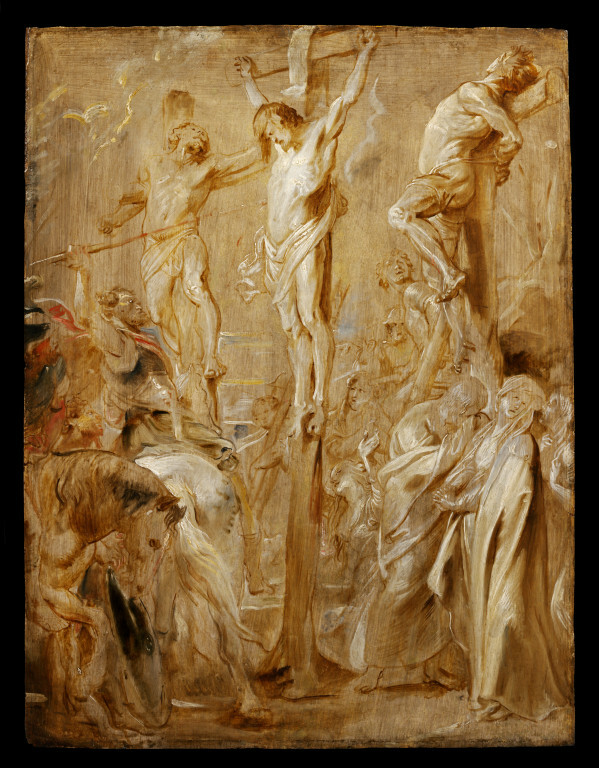 (See for another example of the same technique by Rubens in the collection D.1399-1891). The final version of this design was the high altarpiece installed in 1620 for the church of the Récollets in the city of Antwerp, which is now in the collection of the Museum voor schone Kunsten, Antwerp. The ‘modello’ is thought to date from the previous year. The sketch, which presents an early stage in the development of the design of the altarpiece would have been shown to the monks to illustrate his proposed composition of the New Testament story (John 19: 31-4) in which St. Longinus, a Roman soldier, pierces Christ’s side with a spear to ensure he is dead; hence the title ‘The Coup de Lance’ (in French: ‘hitting with a spear’). Clerical patrons often specified the content of altarpieces, even when not paying for them. In fact, the donor of the piece was Nicolaas Rockox, one of the most cultivated connoisseurs and collectors of the time, and a lifelong friend of the artist as well as one of his early patrons. It is possible that this 'modello' was not the only preparatory study for the final altarpiece. Other sketches in other medium may have been involved in the process. However, this sketch may have been the first as it remained in the collection of the monastery. Rubens adopted the practice of creating ‘modelli’ from 16th century Venetian artists and from Federico Barocci (1533–1612) whom he discovered while sojourning in Italy between 1600 and 1608 and introduced in Antwerp upon his return to the Netherlands. Rubens was an influential painter in the 17th century, contributing in many ways to shape the new Baroque style. He is known to have adapted the Venetian use of intense colours to the dramatic attitudes and asymmetrical groups developed in Roman Renaissance art. The years 1620s can be considered as the pinnacle of his creative activity and the present sketch is therefore representative of both his personal artistic practice and the development of his very personal style which became the hallmark of Flemish Baroque art. Peter Paul Rubens (1577-1640). The Coup de Lance. Oil on panel. G. Martin, The National Gallery Catalogues: The Flemish School circa 1600-circa 1900, London, 1970, pp. 193-7, p. 119, no. 160. J.S. Held, The Oil Sketches of Peter Paul Rubens, A Critical Catalogue, Princeton, 1980, pp.484-5, no. 352. C. Brown, The National Gallery Schools of Painting; Flemish Painting, London, 1987, p. 26. M. Jaffé, Rubens: Catalogo Completo, Milan, 1989, p.250, no. 543. C. Baker and T. Henry, The National Gallery Complete Illustrated Catalogue, London, 1995, p. 593.